“But when the set time had fully come, God sent his Son, born of a woman, born under the law, to redeem those under the law, that we might receive adoption to sonship” (Galatians 4:4-5 NIV). “You disowned the Holy and Righteous One and asked that a murderer be released to you” (Acts 3:14 NIV). “You killed the author of life” (Acts 3:15a NIV). “Joseph son of David, do not be afraid to take Mary home as your wife, because what is conceived in her is from the Holy Spirit” (Matthew 1:20b NIV). “She will give birth to a son, and you are to give him the name Jesus, because he will save his people from their sins” (Matthew 1:21 NIV). “The virgin will conceive and give birth to a son, and they will call him Immanuel” (which means “God with us”) (Matthew 1:23 NIV). It wasn’t just the world that needed Christmas. God needed Christmas as well. I want my kids to know that in my decisions—even ones they don’t like—my objective is to love them and not punish them. So how does God, the creator of everything good, communicate to you and I how He feels about us? By creating Christmas. The apostle Paul, the most famous Jesus-follower of all time, figured this out, even though he started off as a Jesus-hater. Like we said last week, when God saw that the time was right, the stage was set, and He could get the world’s undivided attention, He set Christmas in motion. But a quick history lesson leads us to believe that this was the wrong time. So an empire built on corruption, control, and violence . . . That’s when God felt like He had things just the way He wanted??? But why then? And more importantly, why at all? Why did God have to send Jesus? Paul, who had surely wrestled with these questions himself, continues in his letter. Jesus was accountable to the law—He played by the same rules as His people. Out of His fanatic love for people, God kept pursing them in different ways, trying to draw them back. At Christmas, God took the first step to remove the obstacles that blocked relationship with Him. This was personal, so God had to come in person. God knew there had to be an action so big that history couldn’t deny it! God acted something out for the purpose of showing us something. He didn’t tell us—He demonstrated. Before we even knew that God sent Jesus into this world, Jesus died for us. I remember silently asking this question as a teenager: Why did Jesus have to die? 1) Nobody would’ve believed Him. 2) We couldn’t understand the gift of life. 3) Jesus’ death demonstrated how big our offense was. 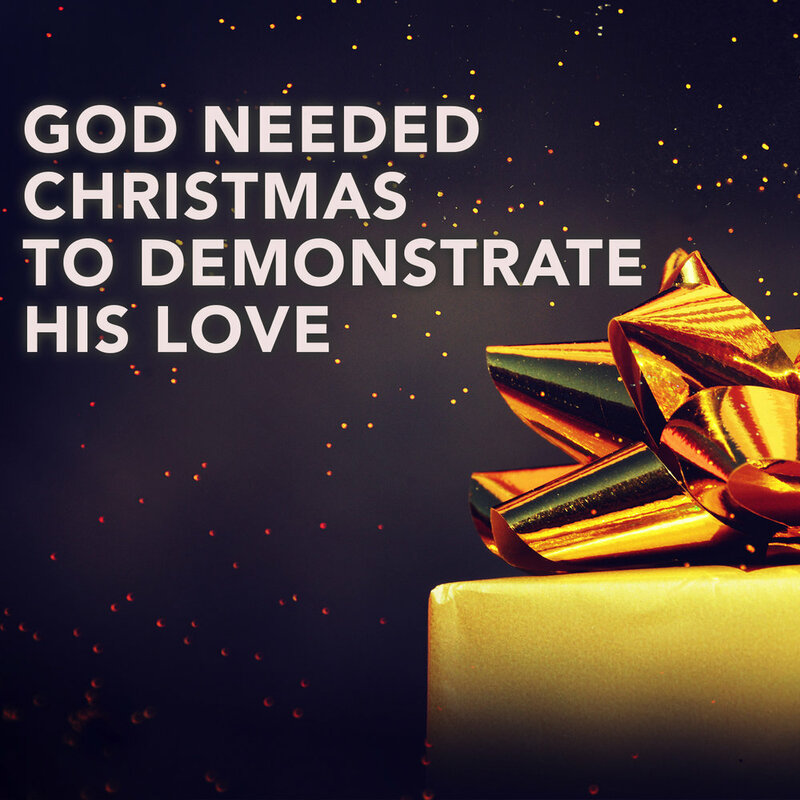 God needed Christmas to demonstrate His love. God staged a demonstration and then documented it so that the world would know thousands of years later. He had to be with us so that we could know He’s for us. We needed a demonstration, which meant God needed Christmas.